Soaring inflation is deepening Ethiopia´s economic crisis. 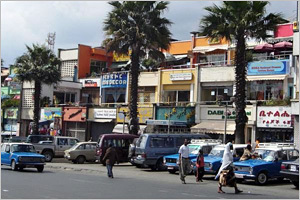 According to the foreign based Ethiopian sources, inflation in the country has reached an alarming 35% in January 2008 while the government sources indicate that it is about 20%. In either case, there is real evidence of sustained increase in the general price level in the country since 2005. The price of cereals has increased fourfold while the prices of raw materials have more than doubled during the past three years. In the country where over 80% of the population lives below US$2 a day, i.e. below poverty line, inflationary pressure of this magnitude puts the basic survival of the majority of the population at stake. In urban areas, many households are said to be already dependent on the government cereal handouts. In rural areas, inflationary pressure is exacerbated by the recurrent drought which exterminated crops and live stocks in many regions. 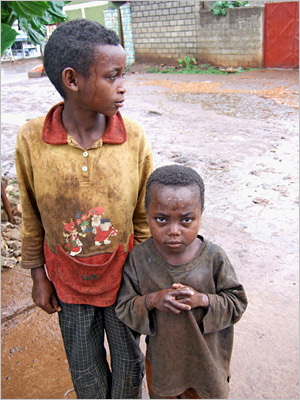 According to both the UN and local sources, an estimated 9 million Ethiopians need urgent food aid for 2008; the never ending problem of this country. The Ethiopian government admits that the inflationary pressure has become very severe. However, it also claims that the economy has been growing at 10% for five consecutive years and it is healthy at present. This can not be trusted for two reasons. First, if the economy has been growing at such robust rate, the country should be able to feed itself. Why do we continue to beg food aid if our economy has been growing at this rate every year for many years? Second, double digit inflation is clearly the sign of unhealthy economy. Because of such wrong diagnosis of the economic problems facing the country, the government recently declared a wrong strategy to control inflation. Instead of devising appropriate economic policies that help tackle the root causes of inflation, the Ethiopian government recently declared a war on what it termed as “greedy” and “criminal” business persons. The same route was followed by Mugabe in Zimbabwe, where inflation is now over a 1000%. The rest of the article is organized as follows: section 2 presents an overview of the causes of inflation. Section 3 deals with the strategies to control inflation. Section 4 analyses the Ethiopian strategy for controlling inflation while section 5 concludes. In the mid-twentieth century, two camps of economists proposed two different causes of inflation. The monetarists argued that money supply was the most dominant determinant of inflation while for Keynesians the real demand was more important in determining inflation than changes in the money supply. Currently, many economists agree that inflation is caused by the combination of both real demand and changes in the money supply. Based primarily on the Keynesian tradition, economists identify two types of inflation: cost-push and demand-pull inflation. Cost-push inflation is caused by the decrease in aggregate supply. Decrease in aggregate supply is in turn caused by increase in prices of production inputs, primarily, labour and raw materials. Ceteris paribus, the higher the cost of production, the lower is the amount of goods and services produced and hence the lower the aggregate supply of goods and services. 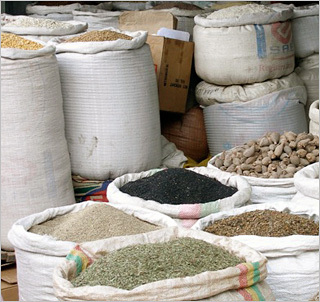 However, other things will not always remain constant and the supply of goods can be influenced by other factors than the increase in the prices of inputs. Therefore, not all inflation resulting from the fall in aggregate supply can be categorized as cost-push inflation. In Ethiopia, the fall in aggregate supply can not be solely attributed to an increase in the input prices. The archaic production technique used in the agricultural sector which employs 85% of the population coupled with the recurrent drought in many parts of the country have caused persistent fall in the production of agricultural output. Therefore, the current inflationary pressure in the country is due to the combination of both cost-push and structural economic problems. The cost-push inflation is aggravated by increased oil prices and prices of other raw materials. Due to the combination of politics and scarcity the international price of oil has increased tremendously during the past two years. The oil price reached the all time high of over US$100 a barrel in 2008. Although the Ethiopian government tried to subsidize oil consumption in the country, the price increase has been significant. In addition to this, the price of other raw materials such as cement has at least doubled in Ethiopia during the past three years due to the combination of increased demand and limited production facilities. On the other hand, demand-pull inflation is caused by an increase in aggregate demand which in turn is the result of increase in either private or government consumption or both, increase in investment demand, increase in money supply and so on. The demand pull inflation is caused by increase in the demand for goods. Therefore, any strategy to control the level of inflation should be based on the economic assessment of the causes of inflation. In many countries, the control of inflation has become one of the prime objectives of government economic policy. Effective policies to control inflation must focus on the root causes of inflation in the economy. If inflation is caused by increased inputs costs and consequently the fall in aggregate supply, the production costs must be reduced to curtail inflation. If the cause is excess demand, the government should reduce the aggregate demand. In most advanced countries the main cause of inflation is excess demand. Accordingly, they focus on the control of the growth of demand through the use of monetary policy instruments, viz, interest rate and real money supply. Monetary policy can control the growth in demand through increase in interest rates and reduction in real money supply. The transmission mechanism of monetary policy is complex. In conventional macroeconomic models the interest rate channel is the primary mechanism of transmission. However, Bernanke and Gertler (1995) have pointed out that the macroeconomic response to policy induced interest rate changes is considerably larger than that implied by the conventional estimates of elasticities of consumption and investment. Therefore, other channels such as the Bernanke credit channel may also be at work. In any case, increased interest rate reduces aggregate demand in a number of ways: (a) discouraging borrowing by both households and firms, (b) increasing the rate of saving, (c) increasing cost of funds and reducing business investment and (d) leading to the fall in monetary inflation, by reducing the demand for lending and the growth of broad money. Demand-pull inflation can also be controlled using fiscal policy. A government can reduce aggregate demand by increasing direct taxes which leads to the fall in personal disposable income and consumption. A government can also reduce aggregate demand by reducing its spending and its borrowing levels. Other economic policies used to control inflation include revaluation of exchange rates and incomes policies or the direct control of wages. Effective control of inflation can only be achieved if there is effective control of aggregate demand through a combination of both fiscal and monetary policy and improvements in the supply side of the economy. Introduction of inflation targets can also enhance the credibility of the inflation control policies. The Ethiopian government recently announced what Heinlein (March 2008) termed as “Tough Anti Inflation Measures”. The core of these measures include a crackdown on what the government calls “economic criminals” referring to business people whom it blames for the recent price increases that boosted inflation rates to 20%. Accordingly, the government established a task force to punish what it calls “greedy and illegal” business persons and asked the public to provide information about those involved in price gouging. However, the crackdown on private businesses does not address the underlying causes of inflation in the country. This strategy is based either on the misconception of the country´s economic dynamics or the deliberate attempt to shift the burden of the failed economic policies to the private sector. According to McMahon (2006), many people mistakenly believe that prices rise because businesses are “greedy”. This is not the case in a free enterprise system. Because of competition, the businesses that succeed are those that provide the highest quality goods for the lowest price. So a business can’t just arbitrarily raise its prices anytime it wants to. If it does, before long all of its customers will be buying from someone else. Thus unless the Ethiopian business firms blamed for increased prices are monopolies, there is no way that they will be able to increase prices on all commodities as they wish. Therefore, the Ethiopian government targeted the wrong causes of inflation and hence its measure is bound to be counter productive. Ethiopia´s inflation is primarily cost-push inflation and what can be termed as structural. It is caused by the fall in aggregate supply of goods. The increase in the cost of raw materials including the price of oil has contributed to the fall in aggregate supply. Speculative behaviours caused by the expectation of increasing prices can exacerbate inflationary pressure. However, since the Ethiopian inflation is primary driven by the sustained increase in food prices, speculative behaviour can not be considered as the driving force behind the current inflationary pressure. Moreover, oil price has increased globally. It can not be the main cause for soaring inflation in Ethiopia. The archaic nature of the production system in the agriculture sector which employs 85% of the country´s population could not keep with the pace of the population growth in both rural and urban areas. This coupled with recurrent drought in many parts of the country has significantly reduced the supply of food grains in the country. The persistent supply shortages led to the persistent rise in the general price level. Thus it is the combined effects of cost-push inflation and structural economic problems that are behind the sustained increased in the general price level in the country. This trend is likely to continue unless the government devices an appropriate policy to improve the supply side problems of the economy. Cracking down on the business people is another grave mistake this government must avoid at all cost. Countries in crisis such as Zimbabwe have followed this route and have failed miserably. The other inflation fighting measures announced by the government include an end to sales tax on food grains and restrictions on the growth of money supply. An end to sales tax on food grains is a good news. However, an imposition of VAT on other activities is likely to counter balance this effects. The reduction in real money supply presupposes that the cause of inflationary pressure is excess demand. In any case, increase in money supply while there is the shortage of aggregate supply of goods is likely to fuel inflationary pressure and hence it is appropriate to keep the pace of real money supply with that of the growth in the real sector. These are appropriate economic policies to control inflation. However, they should be backed by efforts to improve the supply problem. The underlying causes of the current inflationary pressure in the country are both structural and are linked to increased input costs. The government has to focus on these causes if it is to effectively control inflation in the economy. The policy of cracking down on the business people is likely to be counter productive because it fails to address these underlying causes of inflation. The suggested changes in monetary policy and sales tax are useful. However, they must be backed by effective measures to improve the supply side problems. Improvement of the supply side problems requires further changes in macroeconomic policies. These include creating conducive environment for private investment; full privatization of government and party owned companies on food security and other related policies. The country must set its economic priority right. The country must be able to feed itself!! The main driving force behind the current soaring inflation is food prices. Radical policies must be devised to ensure food security as a matter of urgency. If the government is serious about addressing the underlying causes of inflation in the economy, introduction of inflation targeting may improve the credibility of inflation controlling measures. While looking at this picture of two street kids, which I have taken a year ago, a certain question popped up in my mind: How would we feel if we were in the position of taking good care of them and if all roads back home were free from begging kids? Would it feel strange not to see them anymore because we have already taken this reality for granted? Are we so accustomed to see them following us begging for some coins to buy a piece of bread? Is it difficult to remind ourselves that they actually don’t belong where they are now? Are they really unavoidable part of our cityscape and townscape ambiences? Sometimes, when we get used to misfortune of any kind in our society, this misfortune will definitely advance it self to normality. We humans are species who are capable of adapting our self to various misfortunes. And unconsciously we end up accepting an unacceptable situation. These children are obvious signs that something has gone terribly wrong. We have to stop accepting that as normal. ADDIS ABABA, Ethiopia – “Just breathe,” I comforted myself as I shuffled slowly through the dusty gravel. “One breath with each step,” I repeated raggedly as fifty pounds of brackish water sloshed rhythmically against the sides of the muddy yellow jerry can strapped to my back. Sweat rolled down my hairline dropping from my forehead and splashed in the shape of raindrops on the gray slate beneath me. To keep from slipping I tried to follow exactly in the footsteps of the cracked plastic sandals in front of me. A 14 year-old girl in a patched purple dress had already fallen. We struggled to get her upright again; she was pinned by the weight of the can on her back and our own burdens made it hard to lift her from the loose steep slope. “Galatoma, galatoma – thank you, thank you,” she muttered in the southern Ethiopian language of Oromifa as our weakened arms grasped for her. “Many women break their legs walking down the crater for water,” warned Fadi Jilo, a 30-year-old mother of three and 15-year veteran of this water walk. “Sometimes pregnant women fall and miscarry,” she added. On my way to Dillo, a rough, one-road town perched precariously on Ethiopia’s southern border, about 30 miles from Kenya, I thought a lot about water. I had plenty of time to think: the drive from Ethiopia’s capitol Addis Ababa took 15 hours. Cool highlands swaying with eucalyptus trees became rowdy red-dirt towns lined with broad banana leaves only to turn again to a desiccated landscape scattered with brittle thorn bushes, umbrella trees and the otherworldly spindles of towering termite hills. Statistics bounced in my head, along with the bouncing of the tortured tires on our 15- year-old Toyota Land Cruiser over miles of unpaved roads. 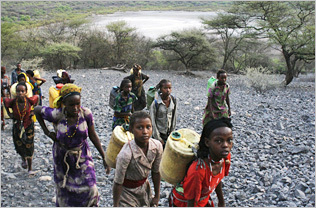 Some of the most shocking water statistics in all of Sub-Saharan Africa are found in Ethiopia. More than 80 percent of Ethiopians live in the country’s rural regions, where as few as 24 percent of the population enjoys safe accessible drinking water. Throughout southern Oromia I saw armies of women and girls with heavy barrels lashed to their backs with homemade rope. They lined the roads in the early morning and again as the heat of the day ebbed, falling in line with millions of women across the African continent seeking this most fundamental resource. t is estimated that on an average day women in poor countries walk four miles and carry approximately 44 pounds of water back to their families. The World Health Organization reports that over 40 billion work hours are lost each year in Africa specifically to the long-distance gathering of drinking water, and Ethiopia is no exception. The United Nation’s 2006 Human Development Report, which focused on water and water scarcity issues, reported that five percent of Sub-Saharan Africa’s GDP is squandered every year due poor water access and sanitation. To put that waste into perspective, think of it this way: more economic capacity is lost annually in Africa due to water related diseases and hours spent laboring to find and fetch water than the region receives in aid. His words were echoed by every curious onlooker that saw me buying a jerry can (plastic drums originally containing industrial volumes of cooking oil). The group of girls and women I introduced myself to in Dillo’s gray dawn met my request to follow them down into the crater and carry a load myself with open alarm. “This is very difficult for us and we have practice,” said Fadi as she and the other women prepared for the first of three daily walks. “For you I don’t know,” she worried, shaking her head a few times before we headed out. Though this walk for water occurs across the nation every day, the details of the walk vary throughout the country. The time can range from one and a half hours to six or seven. Some women carry clay pots, others plastic jugs. Dillo’s source at the bottom of a salt lake crater is unique, but many walks for water are treacherous, especially as they often take place in the early morning dark. One thing all of the walks have in common is that they are almost exclusively done by women and girls, and the water they return with is often contaminated by disease. From Dillo’s town center the group of a dozen women, ranging in age from seven to 40 (the youngest girls armed with five and 10 liter jerry cans and the teenagers and adults with 20-25 liters), laughed and joked their way to the top of the crater that serves as Dillo’s main water source. At the top we stop to stare down at the salt flats glowing an eerie white in the rising light and the small greenish pools that are our destination. Beginning down the steep slope, we fall into quiet concentration. The only sounds are the dry crunching of our footsteps and the occasional hollow bounce of our jerry cans off the narrow rock passages we make our way through. It is a small and indulgently symbolic act to try to put myself in their shoes for one morning. There is no way to compare an hour and a half of my discomfort to what they endure in their lifetime. I will never know what it’s like to spend the majority of my waking hours trying to save myself, my family and the cows or crops that are our livelihood from dehydration. Nor will I experience the disappointment of my school closing for lack of water. If I were literally putting myself in their shoes, the shoes I wore would have been cheap, broken plastic sandals instead of ergonomic walking shoes that cost almost ten times Fadi’s yearly income. If I were putting myself in their shoes, I would have plans to drink the dirty water I carried, knowing that it kills 20-plus people in Dillo each year, instead of giving it away and running to the diminishing stores of overheated bottled water in the back of our car to slake my thirst. Joining this search for water might have been an inadequate attempt at understanding this specific hardship that holds Ethiopia and so much of Africa back from development, but it seemed important to try. In Seattle water is central to the culture of our city – the rain, the lakes, the Puget Sound and the seafood, the lush deep green that we live alongside year round. Water is an abundant luxury that I was born taking for granted – including the cool, clean, sanitized drinking water that has never stopped flowing from my tap and feels like a basic birthright. Water scarcity is a complicated topic in much of Africa. Americans might assume that there just simply isn’t enough water for the population, but in many countries, like Ethiopia, that isn’t necessarily true, and water issues here are discussed much more in terms of management, sanitation and equal access than a lack of natural resources. Addis Ababa-based Water Action and other water-related NGOs insist that there are a number of ways that adequate clean water could reach rural residents in Ethiopia, if the building of infrastructure and sanitation systems were prioritized by international projects and local and federal governments. Unfortunately for Dillo and other semi-arid climates in eastern Africa, water scarcity may also be connected to an ominous global phenomenon that its citizens are not yet aware of. Climate change is a controversial topic familiar to anyone in the United States who has picked up a magazine, newspaper, or remote control in the past few years. The potential scope and consequences of this phenomenon are bound to be the center of – forgive me – heated debate in wealthy countries in the coming years. But as we argue about the potential causes of – and solutions for – climate change, alarming news is emerging from the scientific and development communities, especially those focused of the most impoverished regions of the world. What Fadi and the other residents of Dillo did know was that, while some regions of Ethiopia have been experiencing strong harvests, their rains had not fallen properly in years. The women of Dillo I walked with that morning knew that last year’s rainy season was cut from three months to one and a half and that their usual sources of water were no longer lasting through the long dry season. The children I walked with knew that their schools were closing for lack of water. Looking at the paltry, shallow spring at the bottom of the crater was all the convincing I needed. There were faint rings in the rock above the waterline to prove the higher levels it had once boasted. Dipping my fingers in the green water left them feeling sort of soapy; the water tasted vaguely salted. Hundreds of women and countless cattle use this as their primary source of water every day. The view from below the crater was as terrifying as the view from above was stunning. Orange light was just breaking over the rim of the curved cliffs. Though the sun still seemed distant, an oily ominous heat was already collecting in my clothes. As Fadi helped me strap the now full jug to my stooped back with animal sinew rope, I squinted upwards. The top seemed impossibly far away. Struggling up the hill, I thought about how ironic it is that a people whose entire lifestyle is defined by the limits of very scant resources may already be feeling the effects of the excesses of societies they will never see, people they will never meet. I thought about Fadi and her hope for a full season of rain. I thought of her two young daughters who will soon be expected to make this walk at her side. Then I stopped thinking entirely because I felt like I was going to fall over from exhaustion. Neither the reports I’d read, nor the people I’d interviewed about water walking had ever mentioned how brutally hard the physical act is. Well, my colleague Ernest had: “Twenty-five liters is a lot of weight – you’ll have to carry it on your back or on your head and it’s incredibly hard, very demanding,” he had warned. But I didn’t really think about it – that is, until the ropes were rubbing silver dollar-sized blisters on my shoulders, and I was crawling uphill under the weight of six gallons of water beneath a rising sun. After we’d pulled ourselves up out of the last steep, narrow switchback and crested over the ridge, and after I’d let out an embarrassing shout of relief, to the exhausted hilarity of my fellow walkers, Fadi and I headed back to her hut. Finally home, she pulled the barrel off her bent back and then helped me with mine. We sat down on smooth, handmade wooden stools and shared some of my stores of bottled water. Once my breath finally caught up with me I asked Fadi how life would change if the water situation in Dillo were improved. Water is everything, she told me, fervently explaining its relation to everything from tea and cattle to bathing, health, and sanitation. After stumbling off the truck, totally beaten down by the harsh travel experience of northern Kenya, we dragged ourselves through Kenya border control and walked to the Ethiopian side where the border was closed. We would have to come back at 3pm when it reopened. Spent the next hour or so walking up the hill that Ethiopian Moyale is sprawled across looking at every accommodation option; they were all just that bad. We didn’t have our tent because we didn’t have our bike, and already regretted it. One place had an ensuite bathroom, but there was a very large pile of human fasces in the shower. When we pointed it out to the guy showing us the room he said, “Yes, shower”. Umm…. Things went on in a similar vein, and we finally settled on Tourist Hotel back at the bottom of the hill next to the border post. Cockroaches that could feed a family, but there was a poo-free shower. The next morning we were up at 4am to catch a bus to Addis Ababa. Buses are only allowed to travel between 6am and 6pm in Ethiopia so they try to fill them up as early as possible, and it would take 2 days to get from Moyale to Addis with an overnight stop in Awassa. The trip was the height of comfort and uneventful compared to the truck through northern Kenya, though both days the bus had a flat tire, and both times it was replaced by an equal bald tire. In fact, I could see the weaving so it was beyond bald. The conductors were quick to change it so I didn’t mind, and southern Ethiopia is scenic, similar to northern Kenya with scrubby vegetation covering the dry earth. We noticed a profusion of donkey carts on the road, and this was our introduction to how essential donkeys are to the Ethiopian economy: everything is transported near and far by donkey. From other travellers we had heard nothing but bad news about Ethiopia, especially the begging, and were prepared to hate the country. However, people are friendly and begging to us wasn’t nearly as bad as East Africa. At a lunch stop on the bus a few kids came over to complain that they were hungry, and some older guys threw rocks at them to make them stop begging. Definitely have not seen that before in Africa! Ethiopians are fine featured and tall, and I think the men and women are beautiful. The food is great as well, which is worlds apart from what I would say about most African cuisine: injera, a huge, flat, spongy piece of bread-like substance, covered with some variety of wot (stew), tibs (sautéed meat), spaghetti, or fasting food (vegetarian food without egg or dairy either). Coffee’s very good also as the Italians left lots of espresso machines behind when they briefly tried to colonize Ethiopia in the 1930s. They also left gelato, pasta and pastries, and Ethiopians brew some of the best African beer I have tasted. What more could you want? My only complaint would be that Ethiopians have some inexplicable superstition regarding fresh air, and the windows on the bus stay firmly closed despite the sweltering heat, sun pouring in, and people getting sick. At least we will appreciate the bike when we get back to Nairobi, no lack of fresh air there. Arrived in Addis late in the afternoon of the second day and it was like stepping out of prison. We splashed out on a decent hotel and went out for martinis, wine and dinner at a nice restaurant; after the 5 day ordeal to get from Nairobi to Addis, and the good impression we had of the country on the way up, we were now ready to love Ethiopia. Addis is quite a modern city, but still has oodles of character, great museums, and loads to do. The day after arriving we treated ourselves to coffee and pastries- eating out is a rare novelty on the trip as we usually make meals on our cooker- and made our first attempt at getting a Cameroonian visa. Nick’s application (NZ passport) was accepted, but the receptionist told me I needed an invitation letter (American passport). There’s no Cameroonian Embassy in Nairobi, so we need to get it here. The visa costs US$114 so I would have thought the bribe was included, but apparently not. 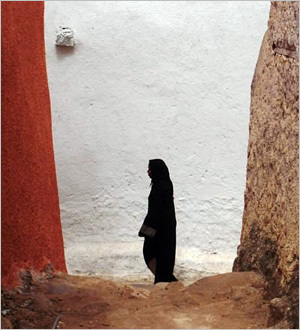 Our next destination was the predominantly Muslim walled city of Harar in eastern Ethiopia. We caught an overnight minibus, much quicker than the buses, and spent the day wandering around the city, checking out markets, alleys, the various gates, and taking it all in. Really cool, picturesque city, and just walking around is an experience. People herding fully-laden donkeys through the alleys, crazy homeless men motioning you over and uncovering a severed camel’s head sitting next to them, an amazing amount of beggars clogging the road inside the walls and sleeping on the cold streets at night. Once walking down an empty alley a huge grey dog that looked half hyena came out of the haze from someone burning rubbish. Scary dog and we weren’t quite sure what to do as it was growling at us and pacing around the end of the alley, but then this kid walked by and held up a stone to scare away the dog for us. He had this big grin, and every time the dog got close, he held the stone higher and it left us alone. Even remembering it feels like a dream. Tried Kitfo, an Ethiopian specialty of raw mince mixed with butter and berbere (a hot, uniquely Ethiopian blend of spices including up to 94 different spices) - tasty. That evening we went to watch the hyena feeding, according to the Lonely Planet a totally traditional, non-touristy event. Other than the floodlights from the tour bus full of aging German tourists… We had to pay an extra 5Birr for staying 5 minutes longer than our time allotment. Still, I got to feed hyenas out of my hand so without the LP build-up it was quite a cool, unique experience. Back in Addis we checked out the National Museum, quite a rarity for us to darken a museum’s door, and so glad we did! We saw casts of the Lucy bones that were discovered in Ethiopia (they keep the real ones locked away in the museum’s archive), and a cast of what her complete skeleton would have looked like, which is short. Also passed by Yekatit 12 Monument to those who were killed during a massacre by the Italian occupiers, and Holy Trinity Cathedral which is the final resting place of Haile Selassie and his wife. We walked around Piazza, a very Italian section of Addis, ate some of the best food we have had on the trip, and generally loved being in Addis. Gondar is another pretty city with lots to see, and was capital of an Ethiopian kingdom from 1636-1855. Other than a bit of bomb damage from when the British helped chase out the Italians after WWII, the castles are in good shape. Most are concentrated in the Royal Enclosure in the middle of Gondar; the Lion Houses were actually used to keep lions until the 1990s, and restoration work has been done on the major castles. 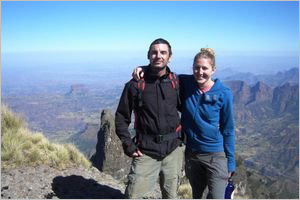 We had been hoping to hike in the Simien Mountains, near Gondar, and were lucky enough to find the perfect group of 3 other people who wanted to do a similar route. There was Karen, a Scottish GP who has been the medical support for a number of other treks, Phil, a crazy Dutch psychiatric nurse who has also done loads of trekking, including to Everest base camp, and was the character of the trip, and Chris, an Aussie corporate bank manager and also well experienced. Could not have gotten luckier with a more fun, chilled-out and fit crew, and they made half the trip. For once we went along with flow and didn’t try to do everything dirt cheap, and had one of the best experience of the trip because of it. We organized the hike through a company (all this was virgin territory for me), and who knew hiking could be so luxurious? Mules carried our food and gear, we had a COOK (! ), bonfires every night, snacks laid out for us when we reached that night’s camp- it was unreal. Everyone agreed that the scenery is some of the best in the world. Everything in Ethiopia is carried by donkey it never took long to reach the next highlight. Waterfalls plunging 400m into gorges, gelada baboons and their constant shagging, valleys and amazing rock formations, picturesque villages, mountain ibex, and generally great scenery. The scout even let us pose with his Kalashnikov. The highest mountain was over 4400m and we were up pretty high the whole time, so it was mighty cold and one morning my breakfast plate kept vibrating off my lap because I was shivering so hard. At least we were always keen to get hiking first thing in the morning! Back in Gondar we had a few boozy nights with our fellow hikers to celebrate, and one night had the dubious pleasure of experiencing an Ethiopian specialty. It’s like Ethiopian stand-up: someone, usually a guy, plays this stringed instrument while a woman sings. She comes around and sings to everyone individually and says either nice things or not depending on how much money you give her. Apparently is wickedly funny, but as it’s all in Amharic she could sing what she wanted to about us. owners try to majorly rip us off and get nasty about it (never go to Mini Fogera), but our last night we went to a decent pizza place, and the waiter made it by teaching me how to shoulder dance (another Ethiopian specialty). I’ll post the video if travel blog lets me. We really went overboard on the luxury side of things, and flew from Gondar to Lalibela as there were no minibuses between the cities, and buses could have taken up to a week. In our usual early morning Gondar state, totally hungover, we could hardly appreciate all the hassle the 20 minute flight saved us. Lalibela’s rock-hewn churches were not the stunningly beautiful masterpieces I had expected, and are probably a teensy bit over-hyped, but maybe once they are no longer shrouded in scaffolding all the work that went into making them will be easier to appreciate. They were built around the 12th Century, and I wondered how King Lalibela knew that the rock went deep enough to carve these multi-storied churches. The actual making of them must have been an amazing undertaking. We were lucky enough to be visiting on St. Michael’s Day, so we watched. Every night he feeds hyenas outside the gates, and the tourists almost outnumber the hyenas the swaying, chanting priests and worshippers in Bet Mikael for a while. 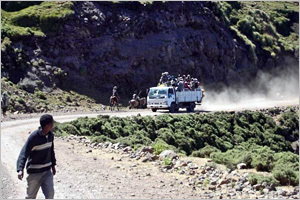 We got the bus back to Addis, 2 days of slow, dusty travel on mountain roads that made us glad NOT to be on the bike. The second day was mostly through road works, and it was interesting to see these camel trains of massively laden camels carrying the building materials. Sometimes their loads were taller than our bus, and the whole scene made me wish the road wasn’t too bumpy for my camera. No pictures, sorry. Addis the third time around was meant to be a quick stopover to get my Cameroonian visa before the 5 day trip back to Nairobi where we still had to fix the bike before flying to Cameroon. However, quick it was not as the Cameroonian Consular took exception to my American passport and repeatedly denied me a visa. Luckily we ran into some good friends we had made along the way, Hugh, an Irish biker, Rene, a Canadian biker, and Guy and Marlaine, a vagabond Belgian couple. Had some good nights out in Addis nightclubs (they really are FULL of prostitutes, Ethiopians have a very liberated view of prostitution), and good times to break the Cameroonian Embassy monotony. Here’s what happened: The US Embassy does not give invitation letters, period, and the standard letter they give out is almost insulting, so I was not totally surprised when I was denied my visa a second time. I now needed an invitation letter from someone in Cameroon. Luckily, my grandparents help sponsor a Cameroonian to study in the US, and his sister, Bea, was happy to help. It took ages to contact her, but I finally did and she wrote me the perfect invitation letter and had it certified. There were lots of problems with fax machines not working, the Embassy staff giving me the wrong email address, etc, but finally the letter arrived. No, denied a visa again, and this time there was no reason and nothing more I could do. We already had our plane tickets to Douala, Cameroon, so I really needed that visa and Nick went back to talk/beg the Consular on my behalf. The Consular railed on at Nick for ages that the wrong official had signed the letter; it had to be the president, vice president, or mayor inviting me to Cameroon! That is astoundingly incorrect, but I should not have needed this stupid letter in the first place and Herr Consular was above fairness. Stunningly, Bea somehow managed to get the mayor to sign the letter. Wow. Already this had dragged on for 2 weeks of me running between the Embassy, internet café, and hotel where I could call Bea in Cameroon. So, I went back to the Embassy and the Consular had left that morning on holiday and would not be back for weeks! The second Consular could give me a visa, though, and when the first Consular’s secretary ran down to ask for my passport, she ran back upstairs saying, “You are very lucky Mr. whoever is not here today. I’m very happy for you!” She came back down for the receptionist to put the visa stamp in my passport and fill it out, and both of them were really excited that I was getting my visa as they both knew me well at this point and were on my side. Now all my visa needed was the official stamp, which would be put in by the second Consular, but he was on the phone. I waited downstairs with the receptionist and secretary, and finally he swept downstairs with my application and told me there was a problem. On the visa application I had given an address in Douala, not knowing I would need an invitation letter, and he wanted to know why I had put an address in Douala when I was going to visit Bea in Limbe. He was on his way to a meeting and told me to come back the next morning and I could discuss it with him. As soon as he was out of eyesight, the secretary and receptionist were shaking their heads and motioning no, then when he left they told me he was a nice man, but I would not get my visa if I came the next morning. They had already put the final stamp in without him knowing! They told me to go, enjoy my holiday, and never come back. To compound it all we were at the same time trying to sort out our flights to Cameroon. We had booked our bike to be on a cargo flight the same day as our passenger flight from Nairobi to Douala December 14th. Now there was some problem with cargo flights in December, but no one quite knew what the problem was. Finally got Kenya Airways to call Nairobi, and were told that cargo flights to Douala were to be terminated as of December 4. No one was sure if we could take the bike on a passenger plane, and as it was so close to Christmas flights to anywhere else in West Africa were full. We really needed this flight to work out. The visa took so long that we would have to change the dates anyway, and the whole thing was such a mess I was looking at flights to Europe! If they hadn’t also been full, this blog may have had a premature ending: it was a trying couple of weeks in Addis. Found out, entirely through our own research with no thanks to Kenya Airways staff, that Kenya Airways flew a 767 on Fridays from Nairobi to Douala, and our bike would fit on that plane. So we rebooked for December 21st, a Friday, and kept our fingers crossed. The morning after the Cameroonian Embassy told me never to return, we were up at 4am to begin the journey back to Nairobi. Again uneventful compared to what lay ahead, and despite all the final frustrations in Addis we were still sad to be leaving: we both decided that Ethiopia has been our favourite country of the trip so far. Ate our last injeras, drank our last Ethiopian beers, and crossed the border to where the fun began in finding a truck to Nairobi. I shall give the last word to the Mursi, by quoting from an interview with three Mursi men, conducted during the making of a television documentary in 1991 (Woodhead, 1991). 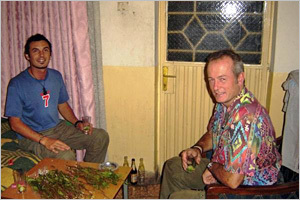 I had known these men for as long as I had known the Mursi. One was the priest (Komoru), or politico-ritual reader of the northern Mursi, Komorakora. One was a relative of Komorakora, Bio-iton-giga, who often acted as a representative of the northern Mursi in their dealings with the government. And one was a younger man, Arinyatuin, who was also used to dealing with government officials. During the course of this interview, with the film camera whirring away behind me, I asked what the Mursi thought about the tourists who were then beginning to penetrate Mursi territory, driving along the motor-track that links the Omo and Mago National Parks. The resulting exchange contained many ironies, but I shall mention only two. First, what began as an interview, with the interviewer asking all the questions for the benefit of the TV audience, turned into a more equal exchange as I was forced to answer my own question – ‘Why do the tourists take photographs?’ – and thereby to confront my own behaviour and motivations. The answer that was eventually dragged out of me could, of course, have served equally well as an explanation of what I and the film crew were doing. Second, my question gave the three men a chance to tell their own ‘lamentable tales’ about the tourists – and, by extension, about ‘the world of the globally mobile’ (Bauman 1998: 88) which the tourists inhabit and from which the Mursi are excluded. Commenting on the failure of tourists to pay what the Mursi regard as a fair price for photographs, Arinyatuin is led, with more justice than he could have realized, to brand all white people as ‘thieves’. DT: When the tourists come up and down this road to the Omo and take photographs, and when we come and film you like this, what do you say about it, privately? Arinyatuin: We say ‘It’s their thing. They are that sort of people – people who take photographs. It’s the whites’ thing’. What do we know about it? You are the ones who know. We just sit here and they take photographs. There’s one [a Polaroid photograph] that, as you look at it, you can see your own body appearing. If it’s bad, tell us. DT: I’m trying to find out what you think, in your stomachs. it. We can ask you, because you speak Mursi. They come with Kuchumba, who just sit in the cars. When the tourists have taken their photographs, they drive off. We say, ‘Is it just that they want to know who we are, or what? They must be people who don’t know how to behave.’ Even old women come and totter about taking photographs. ‘Is this how whites normally behave?’ That’s what we say. DT: (Laughing) So that’s what you say! DT: They come because they see you as different and strange people. They go back home and tell their friends that they’ve been on a long trip, to Mursiland. They say: ‘Look, here are the people we saw.’ They do it for entertainment. Komorakora: Recently, the Administrator at Hana told us, ‘Build a nice big house, with a fence – a big house, well built. The vets can use it when they treat the cattle and the tourists can photograph it. The tourists come to enjoy themselves. They can sleep in the house and go back the next day.’ That’s what he said – what’s his name? Komorakora: Yes, that’s it, Dawit Shumbulu. That’s what he said. We said to each other, ‘Are we here just for their amusement?’ Now you’ve said the same, so that must be it. Bio-iton-giga: If they are going to take photographs, they should give us a lot of money shouldn’t they? But they don’t. DT: That’s bad. Is that how they behave? Arinyatuin: Yes, we are always arguing with them. They cheat us. Bio-iton-giga: They’ll take a lot of photographs, give us a single note, and then get in their cars and drive off. Bio-iton-giga: Of course we do. But they dive into their cars and escape. Arinyatuin: They are thieves, aren’t they? White people are thieves. from the whites, aren’t they? Arinyatuin: Yes. They don’t take photographs. They just ask for food. ‘Give us a goat to eat,’ they say. So we just give them one, When a lot of them come, it’s for tax. Don’t you have tax in your country? Arinyatuin: There’s none of this going round taking photographs with the Kuchumba – they are more like us. This photography thing comes from your country, [smiling] where the necklace beads grow. Give us a car and we’ll go and take photographs of you. David Turton was formerly Reader in Forced Migration and Director of the Refugee Studies Centre at the University of Oxford. Before moving to Oxford he taught in the Department of Social Anthropology at the University of Manchester. I`m a woman of 42, and I live in Norway. I`m trained as a nurse and as an artist. As a nurse, I worked as a foreign aid worker in Nicaragua from 1993-1995. Both my parents used to work in foreign aid. I spent some of my childhood in Uganda, but mostly in Norway. Through this letter I am asking you to help me out with my current art project. The aim of the project is to investigate what would happen if the current roles in foreign aid were reversed. What would the consequenses be if current aid recipients were to be the providers of aid for countries in the West. This idea took form while I was an aid worker in Nicaragua, trying to impose changes to the lives of the people in four villages in the south-west. I was wondering what kind of values they would have wanted to impose on us, and how we would react to having them imposed on us. The question I am posing is therefore: Given the challenges facing Western nations, what aid programs can we envisage as being the most urgent? How could these changes be implemented in the society? Given the premiss of my work I feel that this question is best answered by those of you living in countries receiving aid from the West, or having spent most of your life there. I would like all readers to give me tips of to whom I can send this letter, and everyone is ofcourse welcome to comment on the project. With your permission I would like to use your answers in an art exhibition. 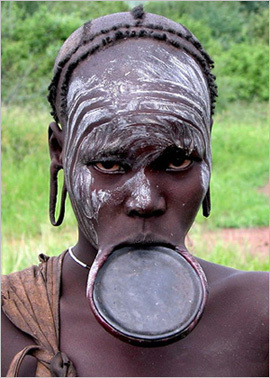 Around 500BC or perhaps even a little earlier we begin to get hints of something exceptional in Ethiopia. Inscriptions written in the language of Saba in Yemen appear on the Ethiopian plateau. With them were found stone altars, elegant limestone female statues dressed in pleated robes, canopied thrones decorated with carved ibex, and those lesser ’small finds’ that allow the archaeologist to piece together the unknown past. At Yeha near Aksum a fine masonry temple, still almost intact, was built. 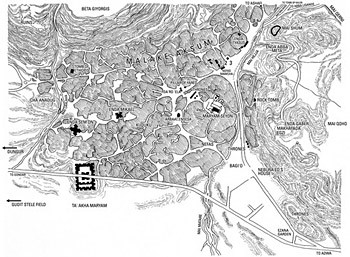 German archaeologists from Hamburg claimed that they have found the palace of queen Saba in Ethiopia. The location of this sensational discovery is the historical town Axum-”Dungur”. The archaeologists announce that the discovery was made in the earlier months of this year. According to their statements, the founded ancient ruins are from the 10th century BC and they remained buried for centuries under a palace built by a Christian king. 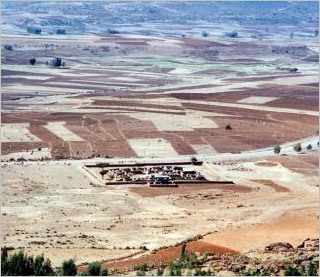 This picture shows a remnant of a palace in Axum-”Dungur” in Ethiopia from 600 -640 AD. The German archaeologists assure that the location of queen Saba’s palace lies just beneath this ruin. Many researcher teams have been looking for the palace of this legendary queen. If this archaeologists are right with their assumption, Ethiopia will be richer with one more historical treasure of a greatest value. I am going through my digital video archive. Digital imaging is a blessing, you can take them and archive them easily and cheaply. Digital imaging is a curse, you don’t know what you have archived because you have too much of it within a small period of time. So, coincidentally, while I was going through my material, I came across a certain occasion I took part back in Addis some years ago . For it was just a short video episode, I started to scroll through each frame to help me recall the atmosphere of that occasion. I remember, an old friend of mine took me to a “Mels” ceremony. Apart from this friend, I knew no one there. But, as you might well know, that is not a big problem in Addis; you know one means you can take part and know everyone afterwards. While looking through each frame of this video, I have recalled faces that I have already forgotten a long time ago. This laughing friendly people on my screen also wouldn’t remember seeing me before. It raises somehow a strange feeling to know that we meet people in many special occasions but the memory that usually remains in our mind will only be the occasion it self. The area was somewhere in Addis where one rarely sees huge villas. Though the only room of that house was so small, we were around fifty in there. One could easily see that the parents of the married girl were leading a life that couldn’t be described as luxurious. But they surely did their best in organizing that occasion for their daughter. The decorative color of brown and yellow from the Tella and the house made Tej in bottles with rolled paper caps accompanied by plenty of traditional food from the best kitchen of the bride’s mother were superb. The small room was filled with the odor of the food and the served beverage. Elderly neighbors were quite jolly in their attitude, they must have been busy tasting the drink earlier. All the neighbors of the family were present. Every body seemed to know each other for a life time sharing all social happening of that area. The hosts, the father and the mother, were visibly nervous and caring. I still remember them going to each guest encouraging to drink, to eat and to dance Iskista. After the festive eating and drinking ceremony, the place was cleared to make space for the young guests to dance. They have been insisting on that right after everybody was clearly satisfied with the eating and drinking part. Soon all guests were standing and clapping their hands while waiting for their turn to be in the center and do some incredible stuff with their shoulder. I remember also doing my part and showing my Iskista talent once or twice. There was no hired professional singer so all were involved in singing; some with descent voice and some far from the right key note. The ceremony had taken quite a long time. We have been there till around 2 a.m. and that was quite late for that area. Now, going through this video frame by frame, I remember those faces. I don’t know their names and none of them asked me for mine. The faded memory is once again alive through these unreal images and I am surprisingly nostalgic. Who were these people? Where are they now? What are they doing? Is that girl still married?…. So many questions without answers. Digital imaging, curse or blessing?……. 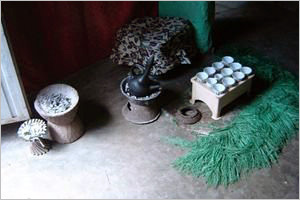 The breadth of Ethiopian music made available by the Éthiopiques is one of the series’ great strengths. In 23 albums we’ve crossed from the rustic songs of farmers strumming bluntly on handmade guitars to mid-century pop singers in sharp shirts. Armed with this set of discs we can jump from a thoughtful pianist nun to a set of 12 songs dedicated to a specific instrument, the square-angled, 10-stringed begena harp. Not many countries get such a sustained examination of their musical output unless they are able to fund it wholly themselves, and few of those examinations are as popular outside the source nation as the Éthiopiques have come to be. 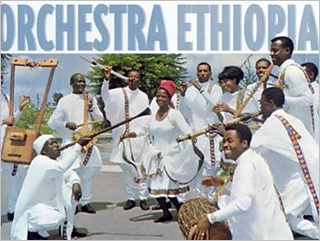 Éthiopiques 23 is devoted to Orchestra Ethiopia. 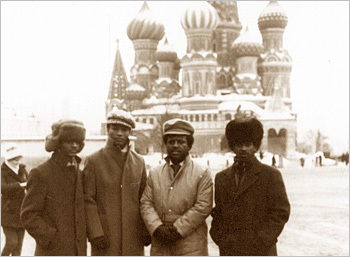 It arrives with a lengthy biographical piece from one of the Orchestra’s past leaders, an American Peace Corps volunteer named Charles Sutton who describes the development of the band. Sutton says that he became interested in the group’s brand of southern Ethiopian folk when he stumbled on a room of musicians performing down an Addis Ababa alleyway in 1966. “It must be a great thing to play the mèssengo,” he remembers himself thinking afterwards as he walked back to his hotel. The mèssengo is a fiddle with a soundbox shaped like a diamond and he did indeed get to play it, as we find out on this album in “Shègitu”. He sings too. We can hear the crowd breaking into waves of applause every time this tall, thin foreigner with his curved flop of hair manages to get his lines out in their native language. His voice is less sure of itself than those of the Ethiopian singers who appear in the rest of the disc, but you can hear that he was up for the challenge, a determined man in spite of the critics who labelled him with the insulting word ferenj, meaning white outsider. A number of these old tracks have a muffled sound, as if they were recorded in the open air and it drew away some of their precise edges. This muffledness affects some tracks more than others, and some instruments more than others. The beating of drums in “Tennesh Mèkèdda” sounds distant, but the noises of flutes and strange winding instruments on the same track are very clear. The result is like the sound effects from a short cartoon, full of knocks, squeaks, and whees, the noise of unsuspecting animated cats being blattered on the head. Even if you don’t own all of the albums they’re referring to, you should still come away from these asides with the impression that you’re walking into a musical world that can expand indefinitely, one CD opening out into another, a musician on one disc reminding you of something that happened ten discs before. 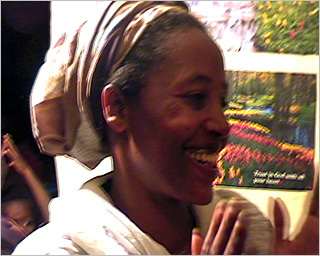 The out of kilter combination of voice and begena in “Kèto Ayqèrem Motu” harks back to the strangely similar sound of Alèmayèhu Eshèté from the album before it, Éthiopiques 22. It’s as if Eshèté with his fashionable suit and dreamboat hair had pulled this older, slower sound out of a bog where it had been preserved in situ like Tollund Man and sexed it up for a nightclub audience. That wobble swells out and establishes itself as a presence. 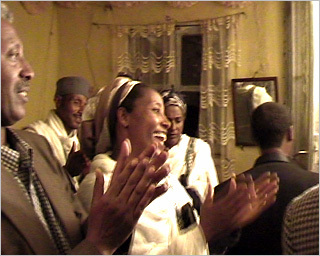 Like Eshèté and every other musician in Ethiopia, the Orchestra suffered with the arrival of the dictatorial Derg junta in 1974. In ‘75 the group fell apart. The legacy it left behind, as presented by Buda, is an eerie-sounding one, sitting partway between the countryside folk music atmosphere of Éthiopiques 12 and the modern professionalism of an Eshèté, between trained singing and artless strum. A good, solid folk group—in other words, talented musicians who were willing to tweak the old sounds and not take themselves too seriously while they were doing it. In the photographs that come with the CD almost all of them are smiling. Fundamental issues of ethnic and religious identity and the agony of exile are at the heart of “Live and Become,” an intermittently compelling swatch of recent Israeli history filtered through the experience of an African immigrant. With epic aspirations that are only partly realized, the movie, directed by the Romanian-French filmmaker Radu Mihaileanu, aspires to be something like a contemporary “Exodus” from an outsider’s point of view. But so many themes converge with so much history, as the film tries to integrate an anguished personal odyssey with two decades of events, many seen briefly on television, that 140 minutes is barely enough time. For most of those two decades the young unnamed African, who assumes the name Schlomo, lives a lie. (He is played by Moshe Agazai as a boy, Mosche Abebe as an adolescent and Sirak M. Sabahat as a young adult, and the movie’s transitions from one actor to the next are smooth.) His secret — that he is Christian and not descended from the Ethiopian Jewish tribe known as the Falasha, also called the Beta Israel — lends the movie its moral traction, as well as suspense over whether his secret will be discovered. Conceptually the film is a sequel of sorts to the director’s 1998 Holocaust fable “Train of Life,” in which Jews pose as Nazis to escape deportation. The story begins in 1985, when the boy is 9 and living with his mother in a squalid refugee camp in Sudan. 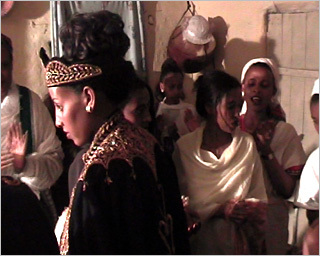 In the wrenching opening scene the mother (Meskie Shibru Sivan) forces her weeping son to leave her side and join the transport of Ethiopian Jews to Israel in the secret Israeli airlift code-named Operation Moses. Under the provisions of Israel’s Law of Return, those with Jewish parents and grandparents could settle in Israel and become citizens; thousands emigrated. 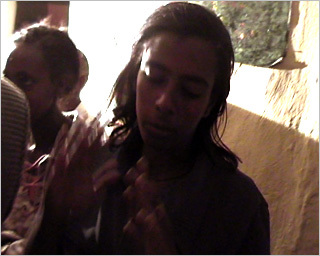 Too young to understand that his life is probably being saved, the boy is substituted at the last minute for Solomon, the dead son of Hana (Mimi Abonesh Kebede), a Falasha woman who agrees to take him. The enigmatic final words of his mother, “Live and become,” resonate through the rest of the film. Drilled to remember the facts of another boy’s identity, Schlomo (shortened from Solomon) is warned never to reveal his true identity, lest he be deported. It isn’t until years later that he realizes his mother’s rejection was his salvation and not a punishment. For the remainder of the film he pines for her, and a recurrent, overused image shows him gazing at the moon and talking to her. Soon after arriving in Israel, Hana dies of tuberculosis and Schlomo is adopted by a liberal French-Israeli couple, Yael (Yael Abecassis) and Yoram (Roschdy Zem), who already have two children. Although they are affectionate and supportive, Schlomo has difficulty adjusting; he refuses to eat, picks fights and tries to run way.Racism is a fact of life. The only nonwhite student in his school, Schlomo is shunned by his schoolmates, whose parents demand that he be withdrawn because he is exposing their children to exotic African diseases. Outraged at their prejudice, Yael storms into the school, throws a fit and, in the film’s most unexpected and moving gesture, publicly kisses and licks Schlomo’s face to demonstrate he is not a health threat. As a teenager Schlomo develops a crush on Sarah (Roni Hadar), a spirited girl whose father, sensing Schlomo may not be Jewish, slams the door in his face and warns that he will cut off his finger if he presses the doorbell again. But the relationship continues long distance after Schlomo leaves Israel to study medicine in Paris. And when he returns after years apart, they marry. Schlomo finds a mentor in Qes Amhra (Yitzhak Edgar), a kind-hearted Ethiopian rabbi who helps him write letters to his mother in his native language. But as he assimilates into Israeli society, mastering Hebrew, studying the Torah and having a bar mitzvah, the movie portrays him as a divided soul torn between his African roots and his assiduously cultivated Jewish identity. The movie is more successful at developing subsidiary characters like Qes, Yael and Sarah than at plumbing the depths of Schlomo’s tormented inner life. Armand Amar’s score, a wailing pastiche of Middle Eastern and Western styles, helps evoke his suffering and longing, but it is both annoyingly repetitive and, like Schlomo’s monologues to the moon, mawkish. As the movie barrels from the mid-1980s onward, its pace becomes choppy. Incendiary emotional confrontations are rushed, shortcuts taken, and the movie screeches to a halt in an overly sentimental ending that is too abrupt to elicit the buckets of tears it might have, given more preparation. Yet “Live and Become” exerts a tidal pull. It makes you feel the weight of history, of populations on the move in a restless multicultural world. It makes you reconsider cultural assimilation, a process that may seem to be complete but whose underlying conflicts may never be fully resolved. Poet Laureate Tsegaye was of the generation—numbering a dozen or so who are extant—of Ethiopian men of letters who were born during the crucible of the Fascist invasion of Ethiopia in the 1930’s. As such his early childhood gestation period was molded by the trauma of that war of aggression against which his patriot father fought. Born in the vicinity of Ambo and the environs of the source of Awash River in Shewa region, the young Tsegaye was also influenced and shaped by the subcultures, languages and the blending of his Oromo and Amhara heritages. Indeed, as he was to relate later on, he considers himself as one who represented an Ethiopian amalgam or bridge between the two cultures. And it did not take long for this child prodigy not only to absorb Oromifa and traditional Zema and Qine in Ethiopic (Ge’ez) as well as Amharic in the traditional neighborhood church school but also to rapidly learn English in the contemporary modern school or Asquala. Indeed, the young genius, Tsegaye Gabre-Medhin, was barely a teen when in 1942 (Eth.Cal. ), he wrote his first play, The Story of King Dionysus and of the Two Brothers, and saw it staged in Ambo Elementary School. It was watched by, among others, Emperor Haile Sellassie himself. Young Tsegaye’s educational itinerary then takes him to formal higher schooling at home (Wingate and Commercial School) and abroad (Blackstone School of Law) in Chicago where he took his Bar Exam. But his precocious self-reading of his inner needs, moods and proclivities pointed towards pastures for artistic and literary expression. And so he pursued opportunities to visit and apprentice at experimental theater and drama establishments in Britain, France and Italy in the late 1950’s. In addition to writing and producing Amharic plays including Yedem Azmera, (Blood Harvest), Yeshoh Aklil, (Crown of Thorns) and Joro Degef (Mumps) during this period, playwright Tsegaye also wrote scores of short poems in English some of which are reproduced in Ethiopia Observer, (1965). And he wrote a prize winning essay for Fullbright Fellowship competition on What Does World Brotherhood Mean To Me, in 1959. Haven’t you yet met someone who gets never tired of narrating about his or her student years in the good old Soviet Union? Most of you must have met someone like that already…. or you are that someone. If you are none of the above, I am hereby going to feel that gap. We are spread out all over the world. Most of us didn’t go back to Ethiopia preferring to stay away in order to search for something we could still not describe. Though many of us might reach a certain goal in our life abroad, I choose to call us “The Lost Generation”. If you have already listened to those stories from ex Ethiopian students in USSR, the ingredients of their narration will definitely throw some light in to this terminology “Lost”. When we talk about our years in Russia, we usually talk about the great life we had there but never about what we have gained after our study and after we left. Unfortunately, most of us learned subjects that we couldn’t implement afterwards. Two strange things hit my mind on my arrival in Moscow. The sun was not as warm as it should be and there was no spice in the food that I first tasted. Two missing essential aspects that could easily discourage a new-comer student from Ethiopia. Before leaving Ethiopia, I remember spending my hard earned money on a jacket in Merkato hoping it could keep me warm through the dreadful Russian winter. It was around the end of September and I knew, I should have invested that money on something else like on ten kilogram of Berbere. Firstly, all of us new-comers from various countries were sent to a big camp in Moscow where I and most of my Ethiopian colleagues had our first experience of seeing so many young students of different origins. We must have been over thousand in this camp and our stay in there was professionally organized. Many Russian young girl and boy students were assigned to help us through different processes of a day. Specially the creation of various groups while the meal time was essential. A lot of chaos would have happened if this young Russians haven’t been around. …. well, we were partially wrong. In the late nineteenth century, about 30 percent of the country was covered with forest. The clearing of land for agricultural use and the cutting of trees for fuel gradually changed the scene, and today forest areas have dwindled to less than 4 percent of Ethiopia’s total land. The northern parts of the highlands are almost devoid of trees. However, about 4.5 million hectares of dense forest exist in the southern and southwestern sections of the highlands. Some of these include coniferous forests, found at elevations above l,600 meters, but a majority of the forestland consists primarily of woodlands found in drier areas of the highlands and in the drier areas bordering the highlands. Lumber from the coniferous forests is important to the construction industry. The broadleaf evergreen forests furnish timber that is used in construction and in the production of plywood. The woodlands are a major source of firewood and charcoal. Certain trees–boswellia and species of commiphora–are of special economic significance. Both grow in the arid lowlands and produce gums that are the bases for frankincense and myrrh. A species of acacia found in several parts of the country is a source of gum arabic used in the manufacture of adhesives, pharmaceutical products, and confectionery. The eucalyptus, an exotic tree introduced in the late nineteenth century and grown mainly near urban areas, is a valuable source of telephone and telegraph poles, tool handles, furniture, and firewood. It is also a major source of the material from which fiberboard and particleboard are made. Data on forestry’s contribution to the economy are not readily available, largely because most GDP tables aggregate data on forestry, fishing, and hunting. In l980/81 forestry accounted for 2.5 percent of GDP at constant l960/61 factor cost and 5.4 percent of the share attributable to the agricultural sector. Before 1974 about half of the forestland was privately owned or claimed, and roughly half was held by the government. There was little government control of forestry operations prior to the revolution. The l975 land reform nationalized forestland and sawmills, which existed mostly in the south. The government controlled harvesting of forestland, and in some cases individuals had to secure permits from local peasant associations to cut trees. But this measure encouraged illegal logging and accelerated the destruction of Ethiopia’s remaining forests. To ensure that conservation activity conformed with government policy and directives on land use, reforestation programs were organized through the Ministry of Agriculture or district offices that planed, coordinated, and monitored all work. The local peasant associations lacked decision-making authority. Reforestation programs resulted in the planting of millions of seedlings in community forests throughout Ethiopia. 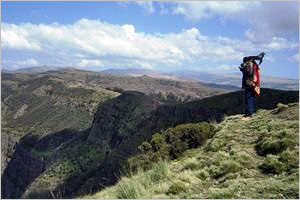 A variety of Non-Governmental Organizations (NGOs), which had to organize their activities through the local peasant association, supplemented government efforts to rehabilitate Ethiopia’s forests. However, critics maintain that both systems caused communal resources to be developed at the expense of private needs. As a result, reforestation programs did not perform well. Seedling survival rates varied from as low as 5 to 20 percent in some areas to 40 percent in others, largely because of inadequate care and premature cutting by peasants. In late 1990, Addis Ababa was in the process of launching the Ethiopian Forestry Action Plan (EFAP) to improve forestry conservation, increase public participation in reforestation projects, and prevent further depletion of existing forest resources. 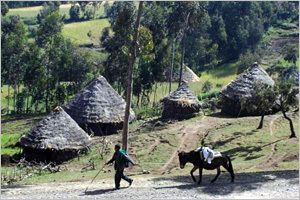 It remained to be seen whether this plan would improve the state of Ethiopia’s forests. 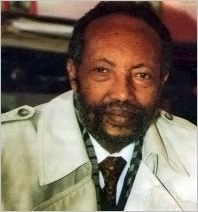 In 1976, after receiving Moscow’s assurance of military assistance, Lieutenant Colonel Atnafu Abate, vice chairman of the Derg, announced that Ethiopia would restrict its future purchases to “socialist countries.” By the time Somali forces captured Jijiga in September 1977, Moscow already had decided to supply military assistance to the Mengistu regime. Within three months of this decision, the Soviet Union had initiated a massive arms transfer program. Approximately fifty Soviet ships had passed through the Suez Canal on the way to the port of Aseb to unload crated fighter aircraft, tanks, artillery, and munitions–an estimated 60,000 tons of hardware–for delivery to the Ogaden front. Moscow shipped additional equipment from the People’s Democratic Republic of Yemen (South Yemen). At the height of the buildup, between November 1977 and February 1978, Soviet transport aircraft, including giant An-22s, landed at twenty-five- minute intervals at Ethiopian airports. An estimated 225 transports–about 15 percent of the Soviet air fleet– participated in the operation. The 1977-78 Soviet supply operation impressed Western observers, who admitted that the display of Soviet transport capability had added a “new strategic element” to the EastWest balance. The Soviet Union drew on large stockpiles of equipment created by high production levels. Soviet aid– which included eighty aircraft, 600 tanks, and 300 APCs–had an estimated value of US$1 billion, surpassing in a matter of months the total value of United States aid provided to Ethiopia between 1953 and 1977. One-fourth of the Soviet assistance was a gift; reportedly, the Libyan government financed a small portion. In November 1978, a few months after the end of the Ogaden War, Addis Ababa and Moscow signed a twenty-year Treaty of Friendship and Cooperation. Among other things, the treaty called for close military cooperation. With the promise of future arms deliveries, the Mengistu regime continued to pursue military victory against Eritrean and Tigrayan separatists in northern Ethiopia. In July 1979, for example, the Soviet Union underwrote Ethiopia’s fifth offensive against Eritrea by shipping military hardware to Ethiopian army garrisons at Mersa Teklay and Asmera. Moreover, Soviet officers reportedly commanded Ethiopian field units. However, like the four earlier ones between 1974 and 1978, this offensive failed to bring rebel areas under government control. By mid-1980 Ethiopia’s military and economic debt to the Soviet Union had grown dramatically. The total value to be repaid was US$1.7 billion, to be spread over ten years beginning in 1984, with 2 percent interest to be paid concurrently on the principal. In addition, Ethiopia agreed to repay a US$300 million commercial debt to the Soviet Union for items such as trucks and cranes. Addis Ababa met these obligations by sending coffee to the Soviet Union and by making foreign-exchange payments from export earnings elsewhere. Throughout the mid-1980s, the Soviet Union’s military commitment to Ethiopia continued to grow, despite Moscow’s purported encouragement of a political settlement of the Eritrean problem. In 1982, for example, Moscow provided about US$2 billion worth of weapons to support Ethiopia’s various Red Star campaigns in Eritrea. The Red Star campaigns were planned jointly by Soviet military advisers and their Ethiopian counterparts. Although the 1982 campaign failed to produce a military victory in Eritrea, the Soviet Union remained committed to the Mengistu regime. By 1984 Moscow had provided more than US$4 billion in military assistance to Ethiopia, with arms deliveries in 1984 (worth approximately US$1.2 billion) at their highest level since the Ogaden War. The number of Soviet and East European military advisers in Ethiopia also grew from about 1,900 in 1981 to approximately 2,600 in 1984. Additionally, by 1984 more than 1,600 Ethiopian military personnel had received training in the Soviet Union. After Mikhail Gorbachev came to power in March 1985, Soviet policy toward Ethiopia underwent a fundamental change. The value of arms deliveries from the Soviet Union and its East European allies declined to US$774 million in 1985 and to US$292 million in 1986. The number of Soviet military advisers in Ethiopia also declined, to about 1,400 in 1988, although it returned to normal levels of approximately 1,700 in 1989. More important, Gorbachev told Mengistu during a July 26, 1988, meeting in Moscow that the Soviet Union was unwilling to increase military assistance to Ethiopia. Instead, the Soviet leader encouraged a “just solution” to the disputes in northern Ethiopia. In subsequent meetings between Soviet and Ethiopian officials, Moscow refused Addis Ababa’s request to reschedule its debt and declined to indicate whether it would conclude another arms agreement after the one in force in 1989 expired in 1991. As further evidence of the Soviet Union’s interest in a negotiated settlement of the Eritrean issue, in early July 1989 Yuri Yukalov, director of the African department at the Soviet Ministry of Foreign Affairs, met with Issaias Afwerki, secretary general of the EPLF, to discuss Ethiopia’s future. Additionally, the Soviet Union expressed support for the peace talks taking place in 1989 between the Ethiopian government and the EPLF and TPLF. Throughout 1990 Moscow continued to reduce its military commitment to Addis Ababa. In March 1990, for example, the Soviet Union announced the withdrawal of its military advisers from all combat zones. Despite Ethiopia’s growing need for helicopters and other counterinsurgency equipment, Moscow refused to conclude any new weapons contracts with the Mengistu regime. It should be pointed out, however, that the Soviet Union honored all commitments set forth in the military assistance agreement, which was to expire at the beginning of 1991.